This was introduced at CES 2014, which took place recently in Las Vegas, MiP is basically a very well balanced robot, a Bluetooth-controlled balancing two-wheeler with gesture sense technology and an app controlled environment. Like us humans, this robot from WowWee has been given a chirpy personality, offering endless fun, i.e. gameplay, dancing, balancing acts, etc. Developed at the University of California, MiP can be easily controlled using your Android or iOS device with the help of an application available on these platforms. 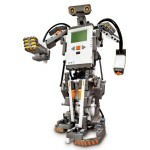 In addition, you can control this robot using hand and object movements. In the box there’s an attachable tray, which allows MiP to carry objects around while still balancing upright, and it can even support the weight of another MiP. If you’ve got a group then they can be linked into a coordinated dance mode, keeping in time with each other like small, glowing line-dancers. If you’re feeling competitive and have more than one MiP in the room you can enter battle mode to box each other, using the app, until one loses its balance. 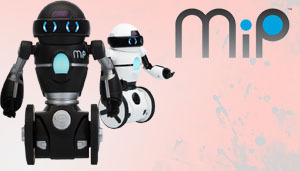 MiP, which stands for Mobile Inverted Pendulum is actually the product of a collaboration between WowWee and the Coordinated Robotics Lab at the University of California, San Diego. 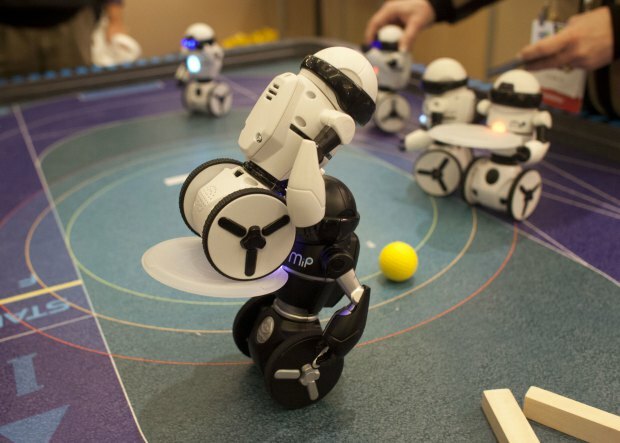 The result of that partnership is a few nifty innovations that, technology-wise, lift the little robot above other recent robot entries like RoboMe (also from WowWee) and Zoomer the robotic dog. The black and white body, round head and emoticon eyes is quite different. It stands roughly 7-inches tall and has no feet. The base instead features two large wheels. The torso includes a mode light and two pose-able arms. This robot has useless appendages and arms simply serve no purpose. You can’t even pose them to hold MiPs tray — MiP has a slot on its chest for that. First of all MiP can, without human intervention, balance and move quite effectively on those two wheels. Give MiP a push and it will right itself. The two-wheel locomotion makes MiP highly maneuverable. It’s also incredibly easy to connect MiP to your mobile phone via the free app. When connected to your smartphone, MiP’s chest glows green. The app doesn’t look like much, but once connected to MiP, it gives you impressive control over the robot. Using two thumb-driven virtual joysticks, one to control direction and the other speed (as well as whether it’s traveling forward or backward), Then you will be able to maneuver MiP around obstacles with ease — it can responded smoothly to the slightest thumb movement. MiP is not the best toy robot, but it may have the most potential. If WowWee continues working with the researchers and adding features to this app, we may soon discover that MiP has a whole new set of capabilities. Is the battery-powered robot worth $99.99? It’s a bit more expensive than Zoomer, but the technology inside may be more sophisticated. Plus, you get that app. On the other hand, MiP does need work. Its autonomous modes are confusing and somewhat disappointing. It can only stack if you drive and those arms are an embarrassment. The self-balancing technology is impressive. The remote-control app is spare, yet easy to use and makes driving MiP a breeze. It really can balance and carry a load. How Convenient would life be if everything turned wireless? In the present world that sees technological advancements every minute, it wouldn’t be wrong to believe that everything can be present at our fingertips. Let us discuss some of the cool Bluetooth-capable gadgets, that are now your wireless puppets. We’ll start with my favourite. 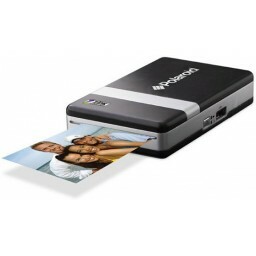 The Polaroid’s PoGo printer(Rs.3835) prints 2×3 inch-colored photos under a minute directly from your phone or digital camera. It runs on ZINK( Zero Ink) Technology. The photo paper has microscopic crystals that are activated by heat in the printer to produce color. The device has a range of over 35 feet, and the rechargeable battery runs for about 15 prints. The photos are smudge proof with a glossy finish. They are also water and tear-resistant. The Medisana TargetScale is a Bluetooth-capable weighing scale that shows you accurately your body mass index(BMI), body fat and water, plus muscle and bone mass aside from your weight. 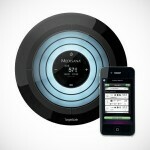 The “smart scale” has flashing rings which gives it a futuristic look, more like the Star Trek transporter. It works in conjunction with a VitaDock app, and sends data to your iPhone or iPad so that users can analyze their progress on the go. It will cost you USD 130, and it isn’t available in India. 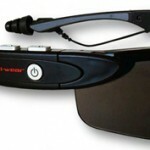 It has Streo Bluetooth connectivity and eye protection in one package. The Q-i-wear stereo Bluetooth Eyewear by iharmonix is designed with dual microphones to cancel ambient noise for clear communication and noise-isolating ear-tips to reduce noise levels by up to 42 decibel. It has on-frame controls and can deliver up to 4 hours of talk time, 8 hours of music playback and up to 7 days on standby when fully and replaceable lenses in clear, gray and amber. It’ll cost you USD 300. How often do you forget your car keys, on your smartphone when you leave the room? Cobra Tag is designed to hang on your keychain, and use the Bluetooth technology so you never lose your phone or your keys. 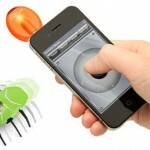 It creates a two way separate alarm between your android or BlackBerry smartphones and the tag. If you walk away with your phone, and the connection is broken, both your phone and the tag start emitting a high-pitched noise reminding you to come back for the keys. If that’s not enough, the Cobra Tag app can send you a text message, email or tweet to inform you that you’ve lost your belongings and for the unmindful people like us, it sends a map to locate the whereabouts of your device. Take note that this device will cost you close to Rs.3200. Now flash your tooth, with Bluetooth. 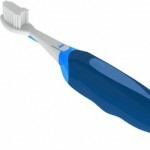 It is true that for most of you, brushing your teeth would not be on top of your priority list. Beam Technologies came up with this high tech toothbrush with sensor, that monitors your oral hygiene habits and sends analysis to your smartphone via Bluetooth. To lure people into brushing for 2 minutes, it also allows you to play music while brushing. Parents can keep a track of their child’s brushing habits by pairing all Beam Brushes to same smartphone. Later versions will track how much time you spent in scrubbing certain areas of your mouth and help improve your oral hygiene. So, there’s no way out for the sloth in you. What’s next, Bluetooth floss? It costs USD50. This Shows the real potential of the Bluetooth technology. The Lego Mindstorm NXT 2.0 for you geeks features 32-bit microprocessor, a large matrix display, 4 input and 3 output ports, and Bluetooth and USB communication link. 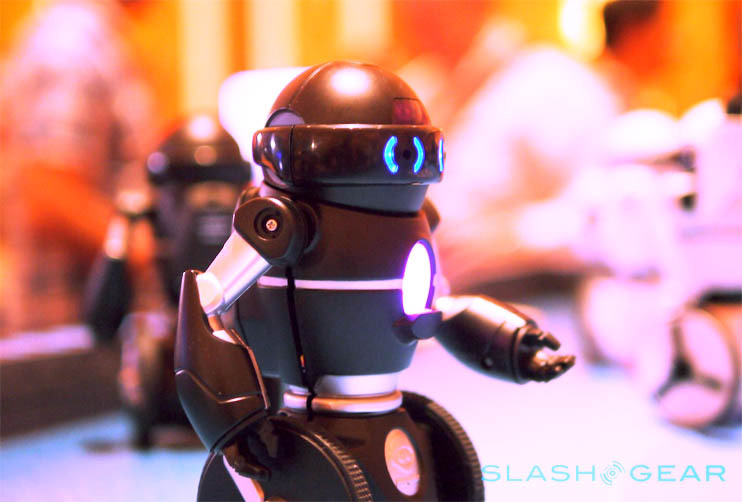 It has ultrasonic, touch and color sensors and 3 motors to make your robot alive. Basically, it is a bunch of electronic parts, motors, gears and cams that can be put together to create different robots that respond to programs you create and transmit via Bluetooth. Once it’s together, you can wirelessly tell your robot to move, spin, make noise and even pick up a ball with its claw. It can be easily programmed using software on your Mac or Windows with an intuitive drag-n-drop interface. The programs are transmitted to the robot from up to 25 feet away. Show off your creation, or take it apart and start over. There’s no limit to what you can build with this kit. Go ahead and buy it just for Rs.19000. It’s compact, it is wireless and it takes full control of your home entertainment PC setup. The keys are twice the size of BlackBerry, but it encourages thumb-typing. The control pad lets you change from touch-pad-style control to directional up-down-left-right controls by sliding a small switch. 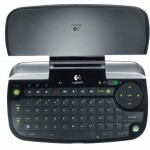 The keyboard has 45-feet range and its battery should run for two weeks of on-and-off use. The diNovo Mini is also compatible with the PlayStation 3, but lacks Apple and xBox360 support. A well-integrated mouse-pad, backlit keys, multiple connectivity options and media buttons make the diNovo a valuable asset. Buy it for just Rs.5000. 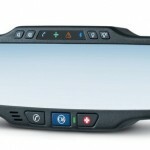 Once found only in General Motors vehicles, the OnStar FMV-“For My Vehicle” is now available as an add-on rear view mirror for a wide variety of other cars. Who knew safety could come in this little a package? The GPS enabled device offers accurate turn-by-turn voice directions, hands-free phone calls and all sort of vehicle assistance. 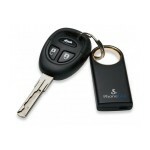 Sync your phone via Bluetooth and make calls without taking your eyes off the road. OnStar FMV provides Automatic Crash Response, 24×7 emergency services, stolen vehicle location assistance and roadside assistance. It will be your favorite assistant on road. This behind-the-wheel peace of mind costs you USD 300 plus installation charges, about USD 200-300 a year for the OnStar services. Unfortunately, we don’t have this service in India as of now.